Clicker Training Horses with Purpose and Joy. I entered Aspire Equestrian's Blogger's Weekend Challenge as per the post below and this was the training plan that Wiola so very kindly gave me. I think this shows that she has an excellent eye and a knack of getting right to the heart of the problem! It's so lovely to have a real plan to work on and I'm SO grateful to Wiola for taking to so much time and trouble! The joy of clicker training is I know if I'm right and I ask Bella correctly then she'll be right too. The freeze frames that Wiola did certainly show how much she mirrors me! Lots to work on and I've already begun so it will be very interesting to see what difference a month can make! It’s a pleasure to help you and I hope you will find my thoughts useful. Congratulations on entering the challenge too My reason for doing the bloggers challenge in this format is so we can all learn from each other. Analysing issues of different riders on different horses is very beneficial for instructors too so I include myself in learners department also. 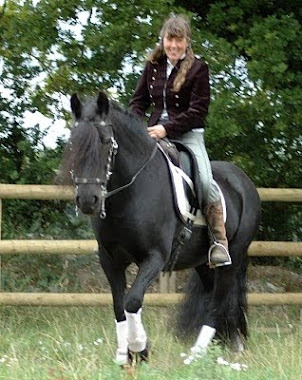 Let’s have a look and try to help Helen and her lovely mare. I love Bella’s elevation in passagey trot, definitely a talent there! She looks in a great condition, very relaxed and content. I see a few things that stop you from feeling balanced on Bella’s back in lateral work so we will look at those first and then move on to how to work on them. I suggest they are addressed first before moving onto more consistent ability to join Bella’s back motion in trot. Bella looks like a very responsive mare and you two seem to have a fabulous relationship so I don’t think you will have much problem correcting the issues. 1) Bella needs to be straighter through her whole body as she travels sideways. As it is now, her spine from ears to tail is twisted in an “S” shape which puts you in a defensive position too and creates viscous cycle. 2) Your outside arm, shoulder, side and leg need to help Bella with her shoulder control. As it is she is taking her neck to inside loading outside shoulder and falling out through it. This makes her lose balance and move on the forehand. 3) Your upper body needs to “behave” independently off your mobile hips. 4) Consistent neutral pelvis and spine position both in lateral work and on straight lines. 1. Wake up awareness of lateral motion and own straightness and ability to “find” neutral spine. Easiest way to feel it in the saddle is to sit on own hands – you need to feel your seat bones pointing directly downwards (not being rolled forwards – which happens as we round our back – or backwards – which happens when we hollow our back). Once you can assume neutral spine it’s time to start from practising the motion off-horse. You can do it in the field in which you ride. Stand in neutral spine posture with your hands on your hips holding a long whip or a long stick behind your back and hooked up behind your elbows. Walk forwards and sideways like this keeping the whip/stick perpendicular to the fence/wall towards which you are “leg-yielding”. Notice how much you need to bend your knees and hips to be able to maintain upright torso and perpendicular position of the whip. Pay attention to your waist and shoulders – they must not turn towards the fence but remain square and forward facing. Keep neutral spine posture as you move. You can start with shallow leg crossing and then increase the sideways motion as your ability to control waist, spine, torso and shoulders increases. IF YOU HAVE A WILLING VOLUNTEER AROUND YOU CAN DO THE PERCEPTION EXERCISES IN PAIRS – IT’S FUN AND VERY REVEALING! Practice yielding like this both ways and make notes which way it is easier for you and which way is harder. 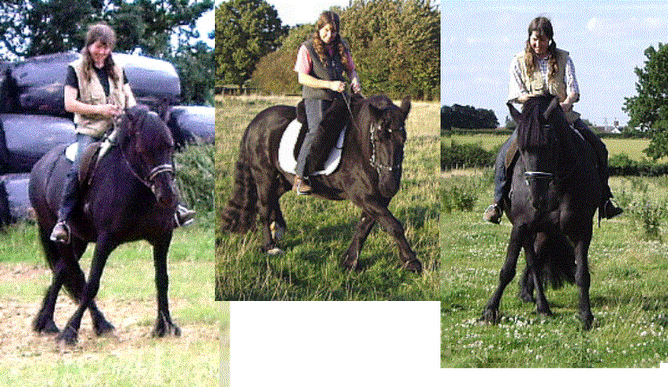 Compare with how it feels in the saddle. You can alternate holding the whip behind your back with holding two whips/sticks right in front of you. Keep your elbows by your side and hold two whips as if they were reins (creating corridor for horse’s neck right in front of your belly button). Then move forwards and sideways maintaining whips position and paying attention that it doesn’t change as you cross your legs. Try to keep the back of your arms in contact with your ribcage (closed armpits) but watch that you don’t feel stiff or tense. Allow your shoulder blades to drop down your ribcage too and try to keep your head up in such a way that you feel the weight of it in your tail bone rather then on your chest…This will help you maintain balance in Bella’s body. I would do this everyday for 10 minutes each side for 1 month (you can also try this in a jog) either in one go or whenever you have time. Upper body control and symmetry will need to become your No1 priority so you are able to immediately feel when your posture deteriorates during lateral movements in the saddle. Positioning Bella straighter before starting to leg yield will help in maintaining your own posture. 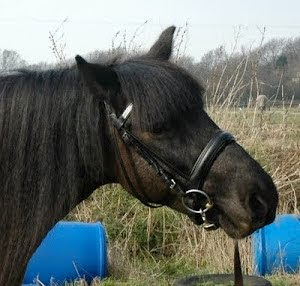 Try to enter your centre line in a trot that you find easy to sit to. As you prepare to leg yield shift your weight ever so slightly onto inside seat bone (not outside) and try to keep your inside leg underneath your inside seat bone if you can. Shifting your inside leg so far back as you have on your video twists your pelvis somewhat and I would think it also makes it difficult for you not to collapse in your waist. I would shorten your reins a little too to help Bella in finding a better place for her neck (right in the middle of her chest) – she is often twisting it to inside which isn’t helping her with her balance. As you leg yield focus on the same feeling of torso, head and shoulders as you had on foot – Look ahead and slightly to the spot at which you want to arrive (not at Bella ) This will help Bella with her shoulder position too. IF YOU FEEL your waist collapsing, torso twisting, shoulder dropping/lifting, Bella’s neck twisting – immediately interrupt leg yield and ask for active forward, rising trot so you can both straighten up for 10 steps or so. Then go back to leg-yield. Aim for 2 straight steps as you start and build up to 10-15 after 1 month. Be disciplined. It’s important not to “just carry on” leaning, twisted etc because you would just be reinforcing a bad habit. The less time you spend in a bad posture from now on the better but you do need to develop feel for when bad habits creep up hence importance of doing it off-horse (without pressure and other things to think about) first. 3. 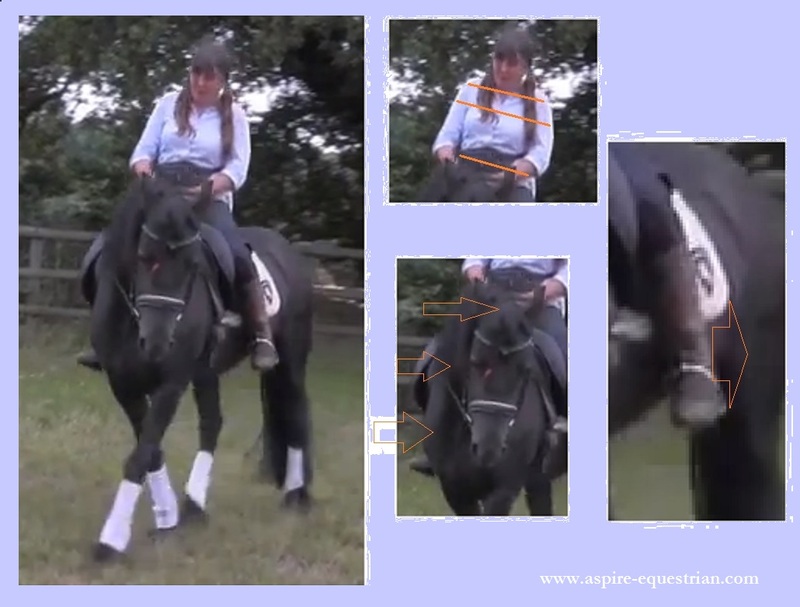 Learn to feel the hind legs and time your leg aid in leg yield. In your video it looks to me as if you were giving Bella one leg aid at the start and then you keep your leg on her Belly as she moves sideways. If this is the case you can add this to the actions that will hinder your feel for unilateral seat bones motion. Try to only use your leg aid when Bella’s hind leg lifts and travels forward (this will feel like a drop under your seat bone and her belly will swing towards your other leg). When Bella’s leg is in the air your aid and seat can tell her whether you want her to step more under or more across. You touch her with your calf aiding across then immediately let the leg aid come off (at the beginning you can literally take your leg away to train yourself and it’s best practised in walk when everything happens slower). As you progress with your feel the aid might just be inner leg tension, then release and the sequence will be barely visible for onlooker but it’s important not to hold the leg [aid] on. 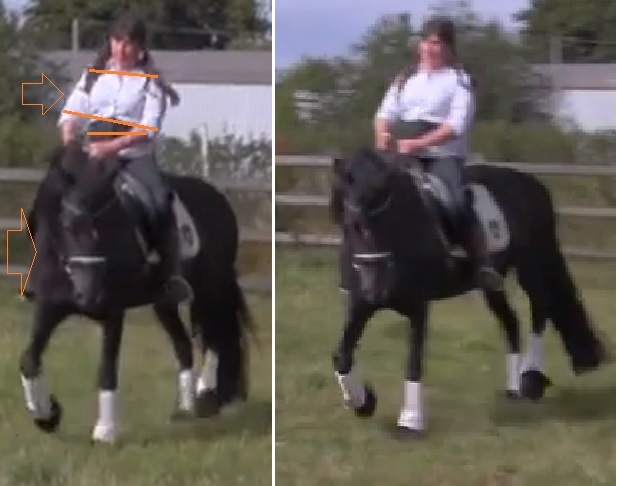 Correct leg use (in time with belly swings/hind legs motion) will help you tremendously with sitting to leg yield in her bigger trot later on. 4. Pick a pace in which you are most comfortable making adjustments and stick to it. When perception starts improving, try to also focus on Bella’s trot rhythm. Find the pace for lateral work in which you are both comfortable in – it can be this little trot/stretchy trot you are doing BUT try to make sure that you don’t alter it as you leg yield or as you straighten out and go ahead. It will not only help Bella developing her balance but will also train your feel for her working in consistent rhythm, it will make you more vigilant to any changes in rhythm and it will also make sideways movements more beneficial as a gymnastic exercise. These are the four things I would focus your training on for the next 6 to 8 weeks. If you follow this advice I would love to see a video update from you in 4 weeks to see how you getting on! Regardless though I will definitely be visiting your blog to check how you getting on. Good luck and well done for being brave and entering the challenge. I am a clicker training addict and there is no cure - thank goodness!!! 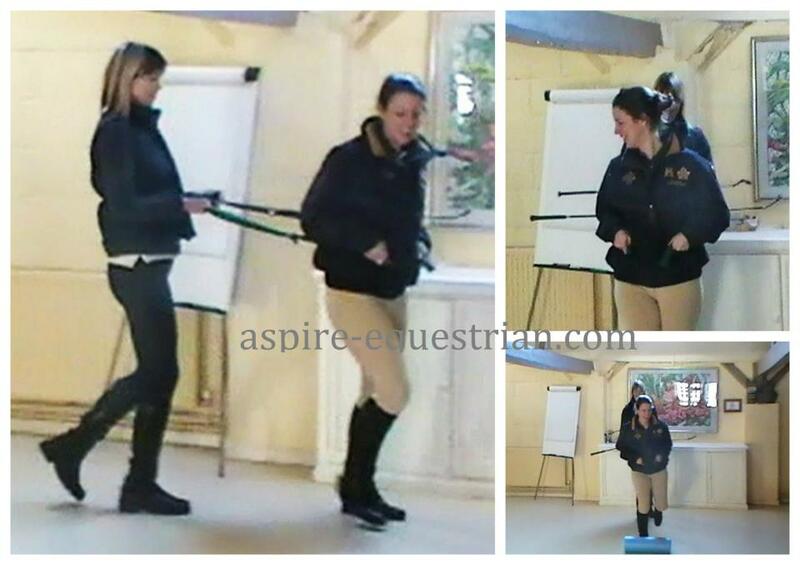 Aspire Equestrian Virtual Training Challenge. Escaro Novillero (Rico) - one year old.